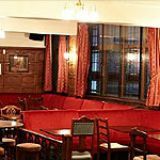 At the Sebright Arms you will find a selection of drinks including real ales and ciders. Live music and DJs are hosted at the Sebright Arms. Do you work at Sebright Arms? What did you think of Sebright Arms? theres alot of work needs to put into the attention to detail in order to pull more inland revenue through visual displays and promotion. 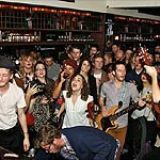 One of the last London homes of music hall entertainment until it closed in 2009, the Sebright Arms has been reborn and now provides pub grub, specialist ales and free gig entertainment E2's young creatives. 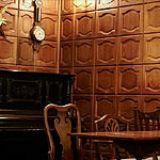 The new owners have wisely decided to trade on the pub’s history and heritage by restoring its dark wood panelling and old-fashioned wooden bar, as well as furnishing it in with a traditional pub-style red carpet. You can either stand by the bar or sit around the large tables on a raised platform in the main room. There’s also a small private room available for parties, and a gig room in the bowels of the building, with a capacity of 50-70 people. A young crowd, mixing the twentysomething trendies in search of fortification before a serious night out in Shoreditch or Dalston, and the thirtysomethings who’ve come from the office but fancy going somewhere with a bit of a vibe. Usually hip indie bands doing the Shoreditch/Brick Lane scene - expect pale complexions and sunken cheeks aplenty. By far the most popular dish on a recent visit was a hearty sausage and mash with distinctive, darkly crisped curly fries and a rich gravy - certainly generous enough to justify its £6.50 price tag. Guest chefs like purveyors of US-style burgers and hot dogs the Lucky Chip crew take up residence for a few months here and there, so it’s probably best to check the current menu before making plans. There’s no doubt that their selection of specialist real ales and ciders is more impressive than most, but there are plenty of household names such as Guinness and Stella to keep the less adventurous happy. You should at least be brave enough to try a well trusted London beer like the Greenwich-brewed Meantime or the slightly darker Redemption from Tottenham. 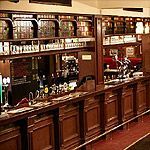 Prices are at the higher of the pub scale, with most pints mere pennies off the £4 mark – there’ll be a slight but definitely noticeable dent in your wallet if you’re getting a round of four or five bevvies in. 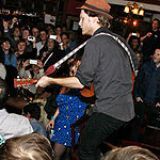 The gigs are a great reason to come and there’s no doubt the Seabright Arms has got a buzz to it, but you'll be paying one way or another via the bar.